Jael is the Chosen One. Born to be a vampire slayer, her destiny was written in the Book of the Shunned. 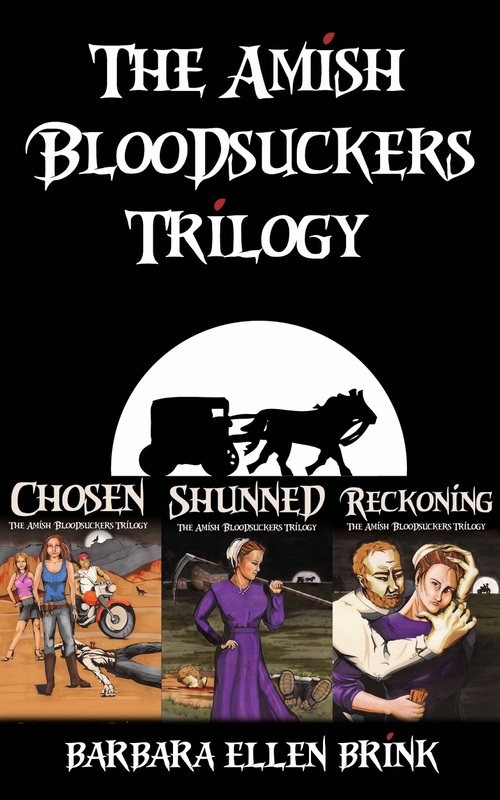 She’s been chosen by God to set the Minnesota Loon Lake Amish community free from the grip of the Bishop, an ancient and powerful vampire who has been using the Amish people for his own personal Jamba Juice. Will she willingly leave her friends and all she knows to follow her destiny to Minnesota or will the Bishop bring destiny down on her in Sunburn, Nevada? Soon Jael is turning sweet sixteen, and all heck will break loose. Leaving Nevada and her friends behind, Jael travels to the Loon Lake Amish community where she moves in with her grandparents and learns to live the plain and simple life… at least as plain and simple as she can handle. She may learn to milk a goat, but she’s definitely NOT giving up her cell phone or crossbow! And at Loon Lake High, she’s found the man of her dreams – an altar boy with access to holy water. But to destroy the Bishop, she must first find out what his diabolical plans are for the teenagers of the community, and put a stop to him and his undead followers before it’s too late. The Bishop is growing his vampire army by leaps and bounds, feeding on the naturally rebellious teenage population. Jael tries to keep one step ahead of the undead and their schemes and maintain a semi-normal life in Loon Lake, but living Amish while still being considered an outsider is beginning to wear on her. With old friends in town for the summer and a boyfriend as loyal as Captain America, Jael is never short of help. The problem is, slaying vamps and having people around that you love can be a dangerous combination. Experience tells her to distance herself from them, but sometimes destiny weaves certain people together and there’s no separation from love. Jael has some hard decisions to make this summer and she’s afraid not everyone will be on board. Will she fulfill her destiny or fall into the Bishop’s trap? Or you can bundle your bloodsuckers and purchase the entire trilogy in one tasty bite! Author note: You might say I was compelled to write The Amish Bloodsuckers. First of all, with all the recent vampire stories, I was simply tired of good versus evil being played in shades of gray. Vampires are the very essence of evil. I fail to see how their pale, toothy faces – even if they sparkle in sunlight – arouse romantic feelings in any young woman with a pulse. At the same time, I was amazed and perplexed by the popularity of Amish fiction. Can romance really thrive without indoor plumbing, electricity, or dare I say it… cell phone coverage? The idea hit me like an Oak stake to the head. I would combine these two genres and capture the magical world that would happen if Beverly Lewis wrote Buffy the Vampire Slayer.